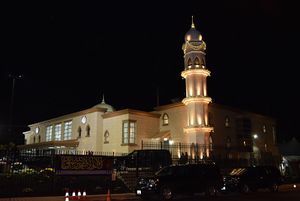 Baitul Aafiyat on the evening of its inauguration. [Baitul Aafiyat mosque (alternate spellings: "Bait-ul-Aafiyat" and "Baitul Afiyat"), also known as "Philly Mosque", is an Ahmadiyya masjid.] The Ahmadiyya Muslim Community is a dynamic, fast growing international revival movement within Islam. Founded in 1889, it spans over 206 countries with membership exceeding tens of millions. Its current headquarters are in the United Kingdom. The Ahmadiyya Muslim Community is the leading Islamic organization to categorically reject terrorism in any form. Over a century ago, Ahmad(as) emphatically declared that an aggressive “jihad by the sword” has no place in Islam. In its place, he taught his followers to wage a bloodless, intellectual “jihad of the pen” to defend Islam. To this end, Ahmad(as) penned over 90 books and tens of thousands of letters, delivered hundreds of lectures, and engaged in scores of public debates. Note: The above descriptive information came from the mosque's About Us page. Philadelphia's largest mosque welcomes all, Philadelphia Tribune, October 22, 2018. This page was last edited on 31 January 2019, at 12:17.